You might be the king or queen of your castle. You’re passionate and creative about your destination’s branding, its unique experiences, its messaging, and the reasons why it is a fantastic place to visit. You work hard to share that message with visitors. But how far does your fame reach? Some destinations truly are world famous. Places like New York City, Paris, London, Rome – these cities have global name recognition. They have become trademarks rather than brands. They are the Coca-Colas of tourism; there are maybe ten or fifteen of these mono destinations on the planet. These brands are strong enough to stand on their own in an international market. If your destination isn’t a global household name, it’s time to look in the mirror. There is a mistaken belief among destination marketers that a DMO can attract more visitors by simply creating a better brand than others through its own promotional efforts alone. If you fall prey to the idea of going solo with your brand, you may be in trouble. Many destination brands are only familiar to their direct neighbours that already understand why those places are important. To show value higher value to travellers, it’s important to answer the question: What would the world beyond your immediate neighbours miss without your destination? What is your unique selling proposition? If travellers aren’t aware of why a destination is important to them, they won’t find the opportunity to visit, no matter how beautiful your cycling trails are, how good your wine is, or how friendly your people are. This problem increases with distance. The further away you seek to reach visitors, the more you will need to join forces with destinations that can complement your brand. Your destination’s brand is the sum of its stories as told by its visitors, residents, and the destination. It needs to be built from the inside out. This gives marketers a clear choice: either compete your nearby destinations to death (with an unfortunate red ocean strategy) or think bigger. Join forces with destinations that have complementary experiences to build on your brands’ greatest strengths. The antidote to the branding obscurity and false fame of the mono destination is to build an endorsed branding architecture. The spectrum below illustrates this option with well-known brands. On one end, Procter & Gamble’s house of brands develops products that can stand on their own across multiple categories, from toothpaste to detergent to shampoo. On the other end, the Apple’s branded house serves as the single brand for all its products: iPhone, iPad, Apple TV, etc. 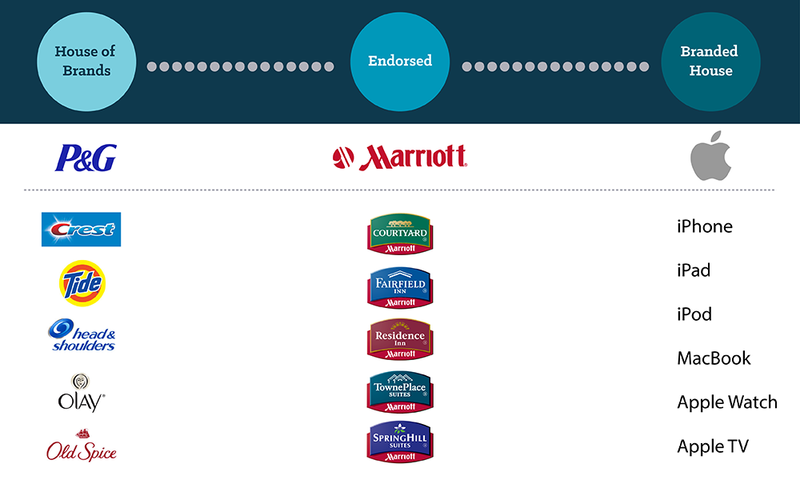 By contrast, Marriott’s endorsed branding places many niche hotel brands under the overall Marriott umbrella. Each brand is distinct and serves a distinct market, but they are all connected to Marriott. This middle option is also a healthy approach for place or destination brands. Each brand becomes an endorser that only needs to step into the spotlight when the targeted niche or market requires it. For example, international visitors may respond better to a national brand than a local one. On the other hand, a local DMO brand may be best suited to attract nearby weekend travellers. Destinations can begin to create this type of branding structure by partnering with their national, regional and local DMOs. They can collaborate to map their brands and experiences in a way that is fair to all partners, as Destination British Columbia is doing with its cities and regions. In another example, Israel’s national DMO, Go Israel, has designed a “Two Cities. One Break.” campaign to encourage international visits to Tel Aviv and Jerusalem. By building their branding kingdom together, destinations can optimize their efforts for where they will be most effective. « Your destination needs to offer visitor servicing through social. Here’s why. The collaboration of the Dutch Hansa Towns (the mediaeval cities: Hasselt, Kampen, Zwolle, Hattem, Deventer, Zutphen, Elburg, Harderwijk and Doesburg) is a good example of such destination marketing. Sure. I was invited by Gelderland last year and stayed in Zutphen – a pleasant surprise! Europe could learn from the Dutch example and do so much more with the Hanseatic League as it is a unifying and organic storyline that brings many cities together.